Treadwell’s GridEX® pultruded FRP grating systems are engineered for distinct applications where a standard fibreglass grating system cannot be efficiently used. GridEX® comes with a number of selections such as opting for the bar shape, custom color or resin, custom fabrication and cross-rod placement in accordance with requirements. The traditional “I” bar shape provides maximum versatility in design. The “T” bar shape offers a sturdier walking surface and prevents objects catching between load bars. The bar type profile is designed to take heavy loads including road traffic such as fork lifts, tow motors and truck traffic. 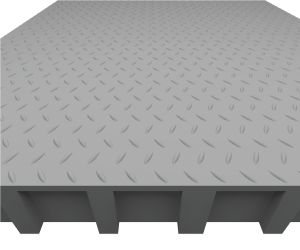 The composite that GridEX® used in the pultruded FRP grating is approximately 75% lighter than steel and around 35% of the weight of aluminium. These grating structures made of fibreglass are easy to maintain and install. Unlike metal grating, one can cut the GridEX® grating easily by making use of simple hand tools. There is no need to utilise ‘hot-work’ tools like grinders or torches. 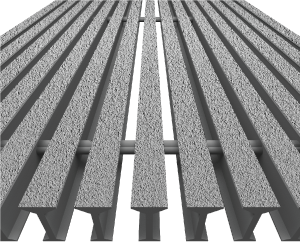 The pultruded FRP grating in the GridEX® range are available in 50 mm, 38 mm and 25 mm depths.